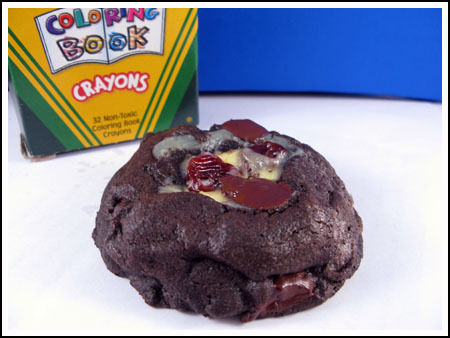 Today’s cookies are thick chocolate cherry cookies with big crater in the middle filled with sour cream and chopped dried cherries. 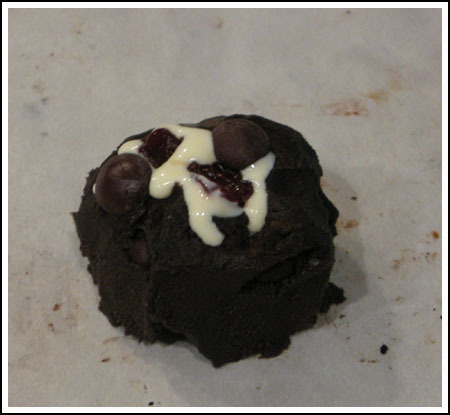 First, I took chilled chocolate dough, molded it into balls and filled it with a sour cream mixture. The cherries came later, but in the end I decided to mix them all in. Next, I pinched up the sides a little. And then I baked the cookies and let them cool and set. They’re not very good hot, but they’re great once they’ve set. The recipe below should give you 16 cookies and hopefully enough filling. I only made a half batch and am not sure if the filling volume is exactly right. Cream butter and sugar until well-blended; Add eggs and vanilla and beat just until incorporated. Scrape sides of bowl and beat in cocoa powder, then scrape sides of bowl again making sure everything is well mixed. In a separate bowl, thoroughly stir together flour, salt and baking powder. Stir the flour mixture into the chocolate mixture. Stir in the chocolate chips. Chill dough for 1 hour or more. Prepare filling. Mix together sour cream, egg yolk, sugar and flour. Stir in the cherries. Divide dough in half. Keep half the dough chilled and shape remaining dough into 8 equally sized balls. 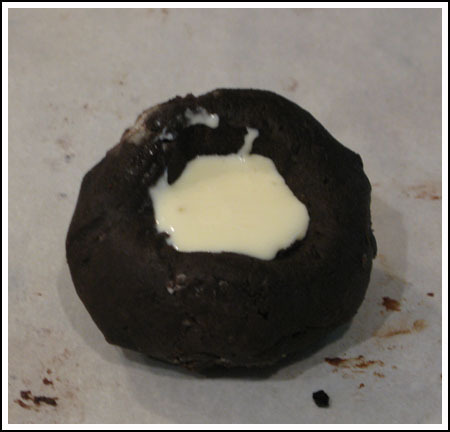 Working one dough ball at a time, mold a large hole in the dough and fill it with about a teaspoon of the sour cream mixture. Do this with 8 balls of dough and arrange them a few inches apart on the cookie sheet. Bake at 375 for 8 minutes. Without opening oven, reduce heat to 325 and bake for another 8 minutes or until cookies appear set. Transfer cookies to a wire rack to cool. While one batch cookies, make remaining 8 cookies. I’ve been searching my brain for ideas with all these cherries. Love the idea of sour cream in the middle. Maybe a little rum too? Those cookies look right up my alley! I have a hard time finding the Hershey’s dark cocoa here too, but I think King Arthur might have a dark cocoa that would work. Great idea for a cookie Anna! Karen, my first try wasn’t successful, but I refined it a bit and really liked this second version. I am surprised the Hershey’s Dark is so difficult to find. They look great, I’m glad you posted it! I wish I could find that dark cocoa in my area but I haven’t seen it yet, I’ll look for it in LA this week. I saw your tweet about all the money spent on baking booze. Been there, done that. Luckily, it doesn’t really go bad :). Whoa. Great minds think alike. I’m making some lush black forest cupcakes now. Chocolate, Cherries, and cream.